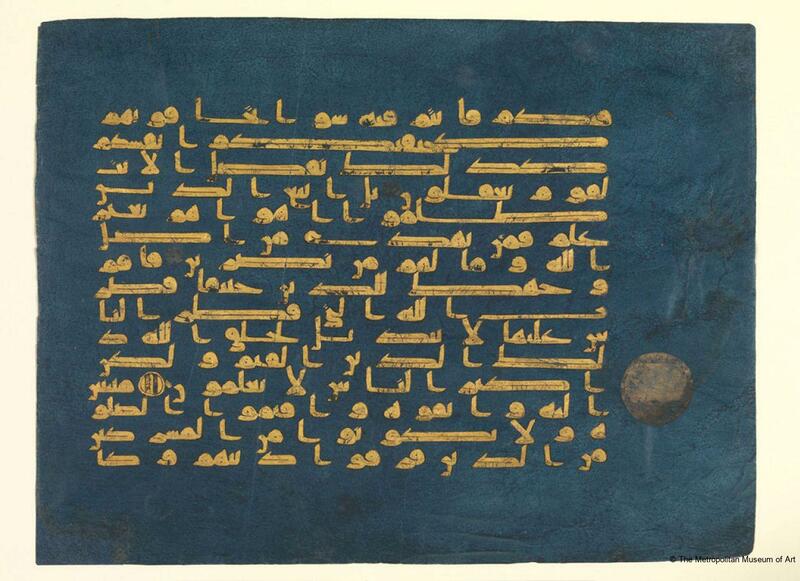 This folio comes from the Blue Qur'an, so named for the rich hue of its indigo-dyed surface. 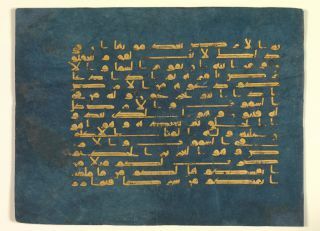 The dyeing of parchment for use in luxurious manuscripts originated in Byzantine tradition and continued into the early Islamic period. 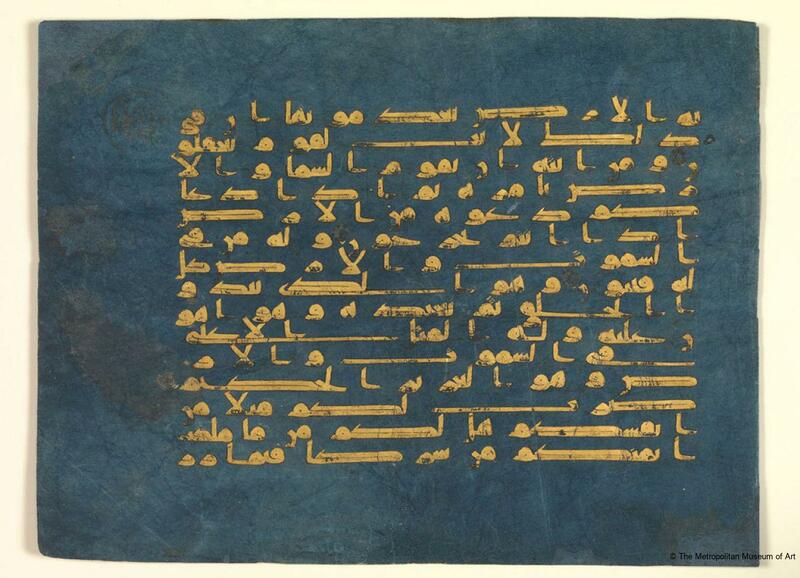 The gold and silver ink of the kufic text and circular verse markers add to the opulence of this folio. While many scholars believe this Qur’an to have originated in Qayrawan, Tunisia, details in its verse markers have led others to argue that it may have actually been produced in Umayyad Córdoba. 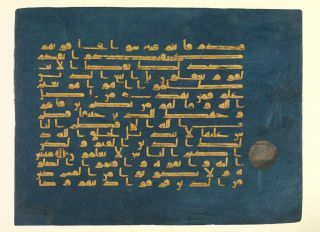 Nevertheless, a description of a manuscript with the same specifications as this one appeared in an inventory of the Mosque of Qayrawan in AH 693 / AD 1293, indicating that it was part of the mosque’s endowment by this time. Carboni, Stefano, "The Arts of the Fatimid Period at the Metropolitan Museum of Art," The Ismaili, (2008): 4, ill. fig. 1 (colour). Carboni, Stefano, Haidar, Navina and Ekhtiar, Maryam, "Recent Acquistions: A Selection 2003–2004", Metropolitan Museum of Art Bulletin, 62/ 2 (Fall 2004): 10, ill.
Ekhtiar, Maryam, Canby, Sheila R., Haidar, Navina and Soucek, Priscilla P. (eds), Masterpieces from the Department of Islamic Art in The Metropolitan Museum of Art, New York: The Metropolitan Museum of Art, 2011: 54, 58–59, no. 30, ill. 59 (colour). Ekhtiar, Maryam, How to Read Islamic Calligraphy, New York: The Metropolitan Museum of Art, 2018: 2, 78-79. Ettinghausen, Richard, Grabar, Oleg and Jenkins-Madina, Marilyn, Islamic Art and Architecture, 650–1250, New Haven/London: Yale University Press, 2003: 98–99, 312. Imbrey, Jai (ed), Mosques: Splendors of Islam, New York: Rizzoli, 2017: 40, ill.